Looking for a fun and safe alternative to your average run-of-the-mill sedan? The 2017 Chevy Spark in Albany, NY is the car you’re looking for. Contrary to what you may think, the Spark is no longer an electric vehicle. Instead, it was replaced by the Bolt EV. Now, the Chevy Spark is simply a fuel-efficient and city-friendly car in 2017. That city-friendly and fuel-efficient nature primarily has the practical design of the vehicle to thank. Something that might not be as apparent to you about the fun-looking design is the structural integrity of it. It’s actually quite safe, even though it’s a small car. Furthermore, you can expect fuel-friendly performance, along with an abundance of standard and available safety features, some of which are driver assist features. The only drawbacks are obvious: slower-than-average acceleration (sacrificed for fuel-efficiency) and not much legroom and cargo capacity (again, sacrificed for fuel-efficiency). Other than that, you’d have to hate the idea of fun to find something wrong with this car. Let’s take a look at the highlights of the 2017 Chevy Spark. Sure, it might have slower acceleration and less cargo space and legroom than some of the other competitors in this class. But, it more than makes up for it. It has exceptional fuel-efficiency, great safety features and scores, and a design that’s fun, practical, and structurally sound. It’s also offered with an impressive number of features for an affordable price, and some of the optional high-tech safety features it can be equipped with are typically unavailable to other cars in this class. If you’re looking for a fun, city-friendly vehicle, the Spark is for you. While fuel-efficiency is the main selling point of the Spark for many people, it’s still important to take a look at the powertrain setup. 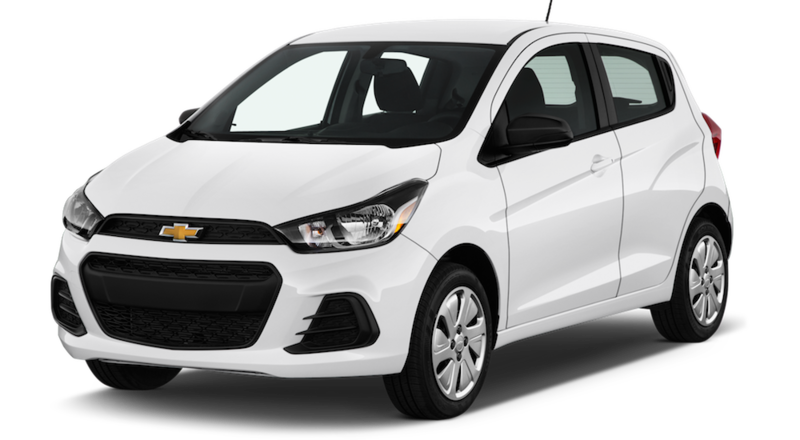 The 2017 Spark is a front-wheel-drive vehicle, with those front wheels being driven by either a standard five-speed manual, or an optional CVT. That CVT is a uniquely designed one, and is able to regulate engine power through two different settings. The first setting simulates lower gears when the driver wants snappier acceleration, and the other setting mimics higher gears for highway travel or other open-road cruising. This transmission is unlike other CVTs, simply because the others are only able to regulate power through a single fixed setting. This gives it a slight advantage over other small hatchback vehicles with a CVT transmission. The heart of the Spark is a 1.4-liter four-cylinder engine that’s rated at 98 horsepower/94 lb.-ft. of torque. While the smaller power output means it gets slightly slower acceleration than other vehicles in the class, its 0-60 mph time of around 11.3 seconds is still sufficient enough for driving city and highway travel. Besides, the bread and butter of the 2017 Spark is fuel-efficiency, which comes in at 29 mpg city/38 mpg highway when a manual transmission is equipped, and 30 mpg city/38 mpg highway with the optional CVT equipped. If you want better fuel-efficiency, then you’ll have to pay an extra $1,000 for 1 more mpg city. Either way, the acceleration of the Spark will stay relatively the same. For standard safety features found on the Spark, you can expect to see a rear vision camera, airbags, high-strength steel safety cage, 4-wheel antilock brakes, and an OnStar Guidance Plan with Automatic Crash Response standard for the first three months. OnStar’s Automatic Crash Response technology is noteworthy, and stands out from the other standard features. While it’s a subscription-based service, it’s still nice to see that it’s standard for the first three months. That way if a collision does occur for a younger driver (the Spark’s obvious targeted audience), an OnStar Advisor is there to help. If the sensors detect a collision, then you’ll be contacted by an Advisor through your infotainment system. They will ask if you need assistance, and if you say yes (or are unable to respond) then they’ll contact emergency services and send them to your location with high-accuracy GPS tracking. For optional safety features, you’re looking at more advanced ones, such as rear park assist, forward collision alert, and lane departure warning. Rear park assist is a feature that works with your standard rear vision camera, and allows you to safely and effortlessly back into parking spots by providing you a warning if sensors detect you’re close to a vehicle or other object. Forward collision alert utilizes sensors to let you know if the Spark is potentially going to hit something, and provide you with a warning so you may take action to avoid a collision. Lane departure warning uses a camera in order to track where the lane lines are. If it sees you are unintentionally drifting out of your lane (lane changing without a signal, getting drowsy, etc.) it will provide you with a warning to snap you back to attention. The IIHS (Insurance Institute for Highway Safety) rates vehicles out of 18 total categories. Everything from overall side impact to driver head, neck, and torso protection is rated. Out of those 18 categories, the 2017 Spark scored the best rating of Good in 15 of them. The other 3? Acceptable – the second highest safety rating in IIHS crash tests. Compared to other small vehicles in this class, it’s actually one of the better ones out there. Let’s talk about the glaringly obvious quality the design of the 2017 Spark possesses: it’s fun. After you glance at it the first time, you do a double-take to make sure your eyes didn’t deceive you. Yes, it really is that quirky looking. Quirky is a good adjective in this case. On top of that, it’s also a five-door (hatchback), which is a very popular style of car currently. Therefore, it’s able to offer something fun and unique in a world plagued with hatchbacks that look mostly the same. Making it even more fun and quirky to drive are its available colors. Sure, you have your traditional black, blue, red, white, and gray colors. But, how about Kalamata (deep purple), Brimstone (yellowish-green), Mint (the name of the paint is descriptive enough), or Toasted Marshmallow (off-white)? Trust me, the names of the colors are just as entertaining as the look of the paint itself. Another easily recognized characteristic is the practicality of the Spark’s design, especially in a city environment, where parking and navigating is typically cramped. Its small size allows it to fit into parking spaces even slightly larger mid-size sedans would fail to fit into, and makes navigating through cramped city traffic much easier. For those who have tried taking a truck or SUV through the city, you know how much of a pain that can be. Now, let’s talk about what might not be as apparent: its structural integrity. It’s actually quite good, and the fun and small design belies just how durable (and safe) the Spark actually is. For starters, it has 10 standard airbags that can deploy depending on where and how severe of a collision occurs. Those airbags (and you) are surrounded by a high-strength steel safety cage, which is designed to both absorb and stop the impact of a collision reaching the cabin. It might be small and fun, but it’s a tough-as-nails car. If you’re looking for even more safety, make sure to check out the safety section to learn more about the available and advanced safety features.